Twelve species of microalgae, isolated from north Australian marine, freshwater and hypersaline environments, were grown under controlled conditions of temperature, pH, photon flux density and salinity, and analysed for ash, total protein, water soluble carbohydrates, chlorophylla, total lipids, total fatty acids and fatty acid composition. Highest levels of the polyunsaturated fatty acid eicosapentaenoic acid [20:5(n-3)] were found in the marine diatoms.Nitzschia (frustulum) andN. closterium (23.1% and 15.2% of total fatty acids, respectively). None of the species studied had levels of docosahexaenoic acid [22:6(n-3)] greater than 1.1 % of total fatty acids. None of the chlorophyte species contained significant levels of either 20:5(n-3) or 22:6(n-3). The highest total fatty acid concentration of all species in the study was found in the freshwater chlorophyte speciesScenedesmus dimorphus (105 mg g−1 dry wt). The hypersaline speciesDunaliella salina had the highest total lipid content (28.1% dry wt), followed byN. closterium, N. (frustulum) andNavicula sp. (24.2–27.8% dry wt).Chlamydomonas sp. had the highest protein content (66.9% dry wt).N. 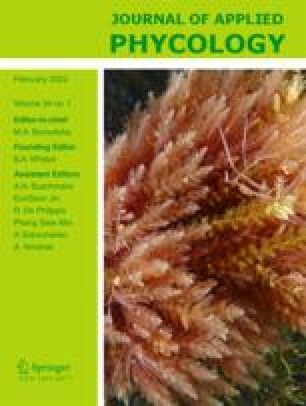 (frustulum) was highlighted as a possible useful source of lipids and polyunsaturated fatty acids in mixed microalgal diets for mariculture organisms used in tropical aquaculture.